My Transport Canada 040 Chartwork exam is finally over - unfortunately I won´t know for 3 weeks if I passed - but I think I did alright - here is my analysis including hints for others still on the road. 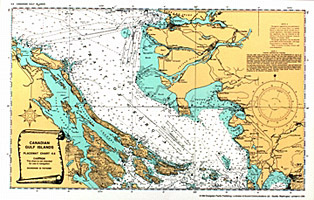 The exam consisted of a Chart (Instructional Chart) from the East Coast of Nova Scotia, a single page of questions with a deviation card stapled to the Back, and an answer booklet. Rules stated that you MUST answer everything in PEN except sketches and what goes on the Chart. Also be sure to read the whole paper (I´m bad for this) the Chart was for 1979 which, through calculation put the variation at 19° 53´ W - reading the exam paper again after working through that I found "Variation 24° W " at the top of the paper DOH! Also important to note - the deviation card was given in Ships Head Compass not the normal Ships Head Magnetic - that I caught right away - thank goodness - but be sure you know how to calculate between the two. There were 4 questions for 10 points and 3 for 20. The first 4 were the 10 point ones and required answers in the booklet only. The next 3 were full-on Navigation problems involving the Chart lots of Variation & Deviation True-Magnetic-Compass conversion problems. EXCEPT question 1 - which had absolutely nothing to do with Chartwork or Navigation and I have no idea why it was on the test! For fun - here is question 1 - just for fun. 1) Your vessel´s fuel tank holds 1872 gallons of gas and is one quarter full - how many barrels of gas will you need to fill the tank if each barrel holds 36 gallons? - where did that come from??? I´m guessing just to throw people - I literally had to read a few more questions to make sure I had the right exam - anyway it was dead easy and basically a bonus 10 points. From there things moved on to real questions - describing light characters and sketching out a fairway Buoy. One question asked how deviation and variation would be affected after a Course alteration. The bulk of the test was calculations between True, Magnetic, and Compass with the questions being given in all three and needing to make conversions to all three including laying off courses, plotting positions via simultaneous ranges, distances, and range and distance. If you are going to study anything - study that stuff! That was also where the ships´s Head Compass deviation card was important.